As many Madisonians know, the Madison Children’s Museum hosts the American Girl Benefit Sale every year. This year’s sale will take place on July 21-22. All proceeds are awarded to nonprofits throughout Dane County through grants from American Girl’s Fund for Children, a long-time supporter of Simpson Street Free Press. Since 1988, the Fund has awarded over $11 million in grants to organizations throughout Dane County that offer arts, culture, and environmental programs for youth. 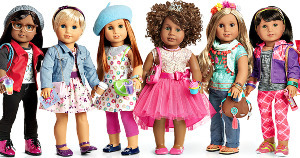 The annual American Girl sale makes this funding possible. To date, the Museum has grossed over $13 million from sale proceeds of overstock and returned American Girl merchandise. This year, the Saturday sale will feature 30%+ discounts on dolls, books, and other American Girl products. Because we benefit from the Fund for Children, friends of Simpson Street can purchase tickets for the event at half-price using the code SIMPSONAGBS. Non-discounted tickets are $8. And don’t forget, it’s free to visit the sale on Sunday, July 22, from 9:00 a.m. to 12:00 p.m., when many items will be reduced beyond 30%. Sale organizers hope to gross $75 thousand beyond what they earned for the Fund last year. Volunteers from the Museum run the sale. SSFP staff and students hope to see all of our friends there! Learn more about the sale on Facebook, here: www.facebook.com/AmericanGirlBenefitSale. You can also check out the event webpage, here: www.BenefitSale.info.